Marchers set off in central London with banners proclaiming "the best deal is no Brexit" and "we demand a People's Vote" in what organizers said was more than one million people strong and the biggest anti-Brexit protest yet. "I would feel differently if this was a well-managed process and the government was taking sensible decisions. 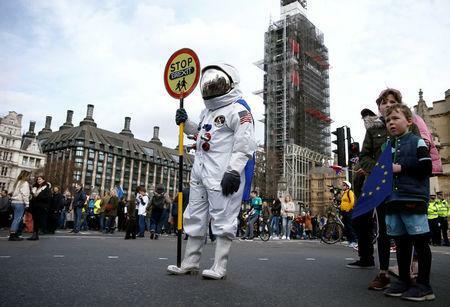 But it is complete chaos," Gareth Rae, 59, who traveled from Bristol to attend the demonstration, told Reuters. The one million estimate would make it London's second biggest demonstration after a rally against the Iraq War in February 2003, which organizers said close to 2 million people attended.